Stephan McCandliss, principal investigator on one of the NASA missions studying Comet ISON as it nears death or destiny, is available to comment about the comet, what it means to scientists and what we can learn from its Thanksgiving date with the sun. To interview McCandliss, contact Latarsha Gatlin at 443-997-9909 (office) or 443-608-6498 (cell) or by email at lgatlin1@jhu.edu. ISON, discovered in September 2012 on its way toward the inner solar system, has captured the imaginations of astronomers and amateur sky-watchers alike. Its projected dive to within 1.2 million miles of the sun on Nov. 28 – Thanksgiving Day in the United States – raised the possibility that it could either be torn apart by gravity and radiation or emerge from the close encounter with a long tail of trailing dust and gas hot enough to glow brightly in the sky. Its inbound trek has been documented by satellites, probes, ground-based telescopes and other missions, including McCandliss’s FORTIS sounding rocket. McCandliss, a research professor and astrophysicist in the Henry A. Rowland Department of Physics and Astronomy at The Johns Hopkins University, directed FORTIS’s launch and re-entry on Nov. 20. The NASA-sponsored reusable rocket’s flight, its second, was designed to collect far ultraviolet emissions from ISON as it travels closer to the sun. Its spectrograph was looking for signs of hydrogen, oxygen and carbon monoxide in the comet. FORTIS, short for Far-ultraviolet Off Rowland-circle Telescope for Imaging and Spectroscopy, launched from White Sands Missile Range in New Mexico and traveled 170 miles above the Earth’s atmosphere, capturing data and then parachuting back to the ground. The rocket had launched from the same range in May, on a different mission. 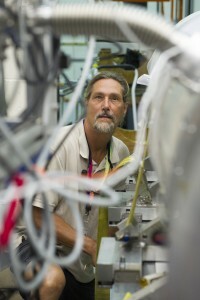 McCandliss is the telescope’s principal investigator. Sounding rockets fly on parabolic trajectories, typically carrying instruments that perform scientific experiments during a brief flight. The rockets are used to carry instruments into space between 60 to 930 miles above the Earth’s surface. FORTIS is currently in the hands of NASA scientists; researchers are digging through data and preparing to conduct post-flight calibrations. FORTIS will be returned to Johns Hopkins sometime during the first week in December. Comet ISON is named for a night-sky survey program at the International Scientific Optical Network.